As soon as the peacekeeping force was withdrawn, the then Israeli Defence Minister Ariel Sharon moved to root out some “2,000 terrorists” he claimed were still hiding in the refugee camps of Sabra and Shatila. After totally surrounding the refugee camps with tanks and soldiers, Sharon ordered the shelling of the camps and the bombardment continued throughout the afternoon and into the evening of 15 September leaving the “mopping-up” of the camps to the Lebanese right-wing Christian militia, known as the Phalangists. The next day, the Phalangists – armed and trained by the Israeli army – entered the camps and proceeded to massacre the unarmed civilians while Israel’s General Yaron and his men watched the entire operations. More grotesquely, the Israeli army ensured there was no lull in the 36 hours of killings and illuminated the area with flares at night and tightened their cordon around the camps to make sure that no civilian could escape the terror that had been unleashed. The atrocities committed in the camps of Sabra and Shatila should be put in the context of an ongoing genocide against the Palestinian people. The MacBride report found that these atrocities “were not inconsistent with wider Israeli intentions to destroy Palestinian political will and cultural identity.”  Since Deir Yassin and the other massacres of 1948, those who survived have joined hundreds of thousands of Palestinians fleeing a litany of massacres committed in 1953, 1967, and the 1982 invasion of Lebanon, and the killing continues today. The most recent being the 2008-2009 Gaza massacre – that 3 week merciless onslaught, a festering sore without relief as the people are further punished by an impossible siege that denies them their most basic rights. 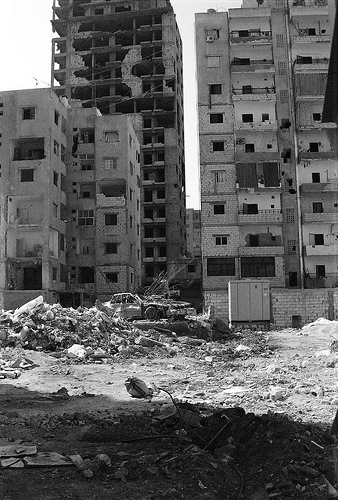 Thus were the victims and survivors of the Sabra and Shatila massacre gathered up in the perpetual nakba of the slaughtered, the dispossessed, the displaced and the discarded – a pattern of ethnic cleansing perpetrated under the Zionist plan to finally and forever extinguish Palestinian society and its people.